It’s days like today that really remind me of the whole Catch-22 of traveling. Will start with the weird. Riding through the spectacular hills around the Solan and Shimla area in Northwestern India today on my way to Mandi, the Endfield Thunderbird 350cc started acting up again, as it had the previous night. When throttled to a certain point the bike starts spurtering. Knowing a bit about bikes I had an idea what was wrong, but wasn’t sure. Thankfully, I made it safe to Solan last night, and hadn’t broken down in the middle of no where. 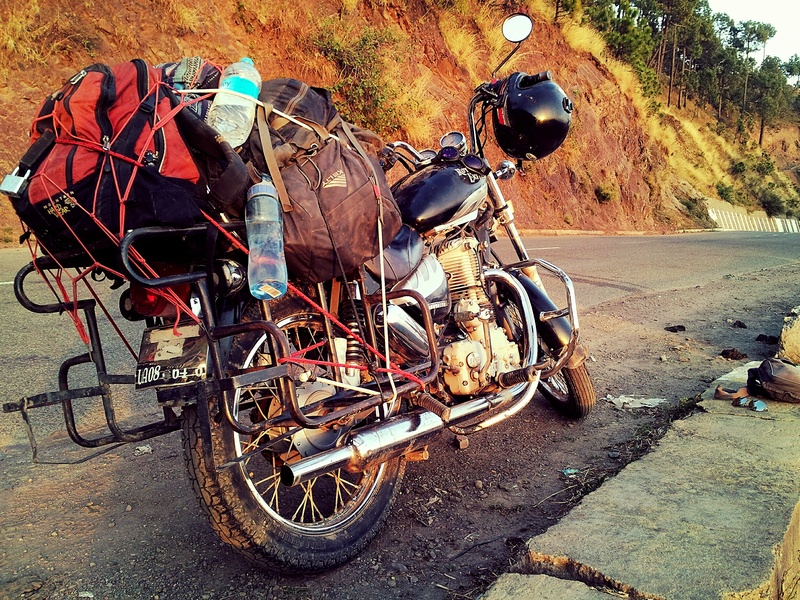 Today after making it through the crowded Highway 88 through Shimla, the bike started to spurted again while driving. At this point I was a good 30ish clicks outside of Shimla, and there was not much around in sight except the grey-purple-bluish hills and greenery everywhere. Then, Narita (she, the bike gave herself a name yesterday) just decides to putter a few spastic times while slowing down in 3rd, and comes to a halt, and shuts off. Ahem. I’ve had plenty of issues with bikes traveling in the past years from the obvious flat tubes in the tires to bald tires to crashes to beyond crashes to fuel lines bursting to driving into a restricted area and spending the night at military barracks to…having your bike decide to completely quit on you no where near a shop, and especially an Enfield shop (which are politely enough placed around India, but mostly in larger towns/cities). Trying a few quick fixes put me no where. Next step: find someone and see if they know anything about bikes. There just happened to be this odd, decently sized building about a fourth of a click back. I walked over to find a few security guards hovering around, one of which spoke decent enough English to have a conversation about what was going on. He tells me to roll the bike over to attempt to get it going near the shop and off the road. After pushing it over, a few tries of the same sort were gone over, and the fuel was checked, as for some odd reason, they were convinced I’d been given kerosene even though I’d told them I’d gotten petrol at a real station. Strange. Through this process, I noticed smoke coming from the carburetor, obviously not a good sign. Narita would not start whatsoever, she’d give a few turns of the engine and that was it. Next step: see if they know anyone they can call for me to pick-up truck the bike back to the Enfield shop I’d seen in Chakkar, right before Shimla, for a fee. A little chat between the guards, and they decide on a number, give it a call, and the guy agrees to come out and take me where I need to go. By this time, the usual crowd of watchers and/or participators has happened. This is a phenomenon here in India that can happen anywhere at anytime as a traveler. You can be going about your merry business of whatever, and this action easily could turn into something that will have a few to a load of spectators just staring you down silently, or asking you in broken English where you are from and what is going on. If something is wrong, a few of these people may help you out in some way. The case today was that the 6 or so men that happened to come out and check out the issue all helped out, which was great, as it required all of us to lift the bike into the back of the truck. Loaded and strapped, Narita sat in the back and I gave many handshakes and said many thank you’s to them all, then took off for the Enfield shop. The driver spoke no English, so the ride was mostly silent except for a random call from a friend traveling through Thailand, which ended up being a perfect little dip out of what was going on to chill out for a moment while driving through the hills. Being around half past six or so, you never know if whatever destination you’re going to will be open unless it’s a hotel or a restaurant – and even then…places just close whenever they want out here. Pulling up to the Royal Enfield shop, we can already tell they’re packing up for the night and shutting down. The driver explains in Hindi what’s up from what he knows, and I give my version in English. Turns out one of the mechanics speaks the language rather well. He takes off his gloves and and sets down his backpack and we grab the bike out of the truck and double wheel it upright inside the garage. Two gents quickly get to work on taking apart the carburetor and fuel filter assembly. The fuel filter is basically black, and the carburetor is cleaned, and the bike reassembled. The main guy (can’t remember his name) takes it for a spin, comes back, and isn’t satisfied it’s working. At this point it’s either the carburetor, or they’re not sure. A second-hand carburetor for a Thunderbird is found, implemented and she’s driven for another test. This is great news, even though at this point the day is basically a wash. You never know if the shop will have the part, how expensive it will be, or a multitude of factors, though you can pick up how much some items are after a while of buying them over and over. The whole process ended up taking about five plus hours and costing somewhere in the 3000 rps range (the shop also did not charge me labor fees, while the two gentleman and lady were working after hours), which in reality is only around $55, though in travel talk that is a day’s worth spending, or when speaking to the right person, four or five days worth of budget. At this specific moment in time I’m a bit tight, so I wasn’t too excited about all this. Begin the Catch-22 of traveling. I’m traveling around a foreign country, literally half way across the world, riding a gorgeous motorcycle that most Indians would dream of owning once in their life time, eating wherever I want, doing whatever I want, and living it up the fullest. Those around me, besides the occasional other backpacker, are mostly earning anywhere from 100-400 rps a day, with your exception every so often depending on their line of work. Today I spend a month or more‘s worth of someone’s income just to deal with fixing my motorcycle so that I could continue on to meet some travelers from Isreal and the UK that I clicked with well in Rishikesh days prior. I notice while traveling in developing countries this notion of a Catch-22…the in-between point of being so overwhelmed with emotions of the positive nature, while plowing through neighborhoods of very poor human beings, who only many times, have this idea in their head that coming to wherever it is that you come from is a much better place than where they reside. In some cases, this is absolutely true. I’ve seen slums so humbling out here in India and other countries in Southeast Asia, that I was silent for hours. Coming from white, middle-class America in Edmonds, WA, places of this nature were as unknown as walking on the Moon until I saw them, breathed the air, and felt the energy of their people. This notions will always remind that while my country, the United States of America, is not perfect by any means (mostly due to the government and the people paying the government), it is a country where you more than likely are driving a car, saying whatever you want, own a laptop and an iPod, go through smartphones all the time, and hey, you even have a shower head and a toilet to sit on! So many in Westernized countries forget that most of the world does not have these leisures that many would freak out if they did not have. I am extremely fortunate for what I have been able to see and witness in countries far away from where I am from, and usually reside in. Tell the larger percentage of Indians or Southeast Asians how much a plane ticket costs to the States, and you just get a smile and laugh, with the vibe that they know they’ll never be able to afford it, or afford the trip with enough space to be able to take a ‘holiday’ or even better, live and work in instead. I am humbled a thousand fold by this, and when the travels get tough for whatever reason, need to remind myself exactly what it is that I am able to do because I was born in the United States to a loving family with a solid income (thanks Mom and Pop for everything!). Tomorrow I will ride on towards the Dharamsala area and continue to smile heavily towards every single sentient being wherever it is I decide to stop or stay. There is reportedly 7.1 BILLION humans on Earth, and we are all special in our own way. The views and the beaches and the motorcycles and the food (gulab jamun!!) and the ashrams and the temples and the backpackers and the lifestyle of traveling are exciting, stunning, and breathtaking – but being able to meet human beings that have a different set of beliefs and lifestyles through the planet – this is life changing, and I will forever take to heart how massively unique this our rock flying around the Sun truly is. When we figure out how to unify as a planet, as a species, something magnificent will take place. I have hope.